GREENBURGH TOWN HALL CLOSES EARLY IN ANTICIPATION OF LARGE PROTEST AGAINST TOWN ALLOWING BUILDING TO BE USED FOR ANTI-ISRAEL MEETING AND FUNDRAISER | The Edgemont Community Council, Inc.
Greenburgh Town Hall was abruptly closed for business this afternoon — with no prior notice to the public — as Greenburgh police prepared for a massive pro-Israel march and rally at 5:30 p.m. to protest Town Supervisor Paul Feiner’s decision to allow a non-Greenburgh anti-Israel organization free use of Town Hall this evening at 6:30 p.m. for a meeting to raise money for an international economic boycott of Israel. Residents at town hall report that the building has been emptied of town employees, metal detectors have been set up at the building’s entrance, with cones and barricades erected presumably to separate demonstrators from those attending the meeting. Town employees were told that police wanted to do a “sweep” of the building at 4 p.m. with bomb-sniffing dogs; they were told another “sweep” is planned after the event tonight is over. 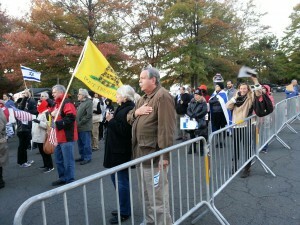 A website for the Jewish Rapid Response Coalition reported that hundreds of flag-waving students and their families assembled this afternoon at Grand Central Station to take Metro North to the North White Plains station, where they plan on taking shuttle buses to Town Hall, which is about 1.2 miles away. There has been a virtual media blackout on the event — presumably in an effort to keep people from showing up — although a reporter from the Journal News is present and television trucks from News12 and News 4 have arrived on the scene. Mr. Feiner reportedly made calls to local Jewish groups in an effort to discourage them from attending the rally which, when such efforts were reported, appeared to anger those promoting the rally. And at least one of the speakers at the rally angrily criticized Mr. Feiner for having done that. However, as of 5:45 p.m., there were around 150 hundred people at the rally with more streaming in. There were patriotic songs being played and many held colorful banners. Meanwhile, in an effort to both introduce and promote himself to those who might not have known who he was, Mr. Feiner distributed a five paragraph single spaced letter to those attending the rally in which he defended his prior failure to have a building use policy in place, promised to enact one in the future, said he is “active in synagogue” and supports Israel. Many of those attending, including dozens of Greenburgh residents, expressed their anger at Mr. Feiner for allowing the “anti-Israel” event to take place and for trying to use the pro-Israel rally to engage in self-promotion which several said they found offensive. Most municipalities in the United States have enacted reasonable “time, place and manner” content-neutral restrictions on the use of municipal facilities in order to prevent outside groups from holding meetings that might generate this kind of need for costly security to ensure public safety and no harm to public property. But Mr. Feiner, who was ridiculed after 9/11 for not allowing the Town’s Antenna Review Board to meet at Town Hall because he was feuding with its members, never adopted any such building use policy, although one was adopted for the town library and the Town’s parks and recreation facilities. Mr. Feiner got into trouble two years ago for not having a building use policy when Republicans learned he was letting the Obama campaign have free use of Town Hall to conduct phone banks. He promised at that time to enact a proper building use policy, but never did. Now, Mr. Feiner claims that because he failed to enact a building use policy, he had no choice but to allow the anti-Israel group to hold its meeting tonight or Greenburgh taxpayers would face yet another lawsuit against the Town, this time for violating the group’s First Amendment rights of free speech. Greenburgh taxpayers are already paying $6.5 million to settle another lawsuit in which Mr. Feiner was found guilty of violating the constitutional rights of a church. The settlement for religious discrimination is reportedly the largest of its kind against a municipality in the United States. Police Chief Chris McNerney had urged Mr. Feiner not to allow Town Hall to be used for the meeting tonight, citing security concerns. Greenburgh residents meanwhile who came to Town Hall to do business this afternoon said they were being turned away, starting at 4 p.m., and blamed Mr. Feiner. “This lack of policy for using town hall has now cost the taxpayers thousands of dollars in lost production time,” one resident said. This entry was posted in Police, Supervisor, Town Board, Town of Greenburgh and tagged Israel, jewish rapid response coalition, Jewish Voice for Peace, Local, Local News, Local Politics, Palestinians. Bookmark the permalink.